or life-threatening illness in an effort to keep families together. Alana seemed to be a normal baby. She was hitting all of her milestones and almost crawling by eight months. We started noticing extreme fatigue, failure to eat/drink, loss of body control, constipation and dehydration. We knew something wasn’t right…. We want to personally thank TCC Gives for your generous gifts of $8,000 in Grants, 5 boxes of stuffed book-bags for the A.I. 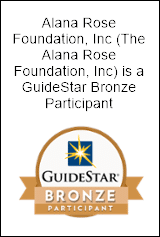 School Program, acting as a collection site for our annual Alana’s Gift at the Eastern Region Verizon Stores, recognizing The Alana Rose Foundation as your preferred non-profit community partner of 2018 at your Rehoboth Beach Avenue location, and your employees volunteering their time for The Alana Rose Foundation in 2018. Your willingness to help children and families in our community weather the crises in their lives makes all the difference. Thanks to you, we have provided families with financial assistance to help with travel, housing and/or living expenses for qualified families, making children happier and healthier by keeping their family together.